Formulation: Lyophilized. In PBS, pH 7.2, containing 1% sucrose. No preservatives. For a stock solution of 1.0mg/ml, reconstitute with 100mg/ml of sterile distilled water. Scientific Background: RanGEF, also known as regulator of chromosome condensation (RCC1), is an abundant, highly conserved chromatin-associated 45 kDa protein. RanGEF is involved in the regulation of the onset of chromosome condensation in the S phase, and is the principle mammalian guanine nucleotide exchange factor (GEF) for the nuclear G protein Ran. RanGEF plays important roles in RNA transcription and processing, DNA replication, nuclear pore transport function, and cell cycle regulation. 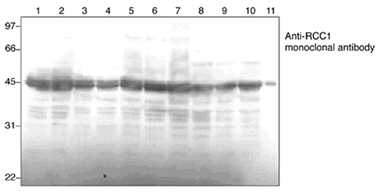 Western blot analysis of RanGEF probed with RanGEF (RCC1), mAb (3D11).